Bhi Bhiman: Penetrating Melodies, Striking Vocals The second-generation Sri Lankan-American is an accomplished guitarist and a natural bluesman. 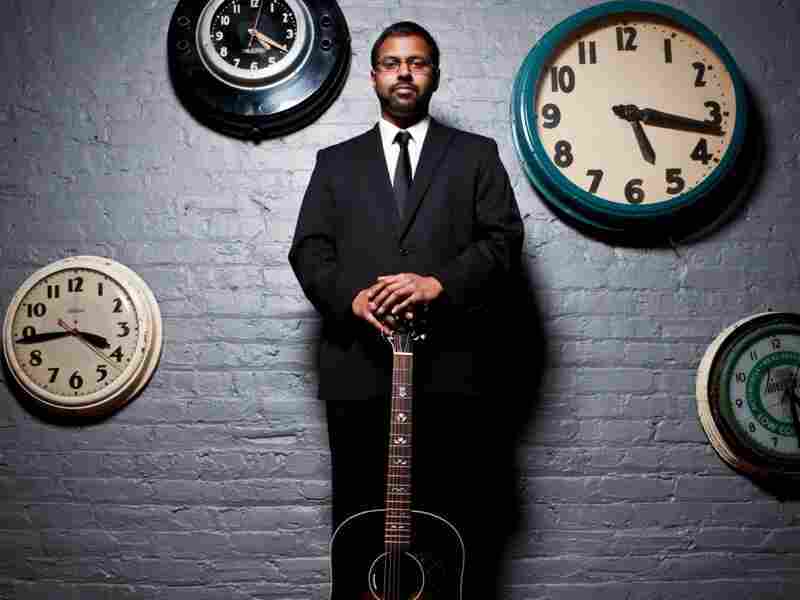 Bhi Bhiman is a second-generation Sri Lankan-American with a flair for the blues. His new album is Bhiman. Performing a brief, early opening set in Manhattan one recent Monday, Bhi Bhiman looked like a law clerk in Mumbai stopping by for a drink after work: a neat South Asian man in a newsboy cap and glasses, wearing a gray sweater over a wing-collared white shirt. Except for one thing: He was holding a big acoustic guitar and picking it, John Hurt-style, as he sang a little something about kimchee. Singing blues in a voice that suggests a more modest Nina Simone would be an unusual formal choice for any young person in 2012. For a second-generation Sri Lankan-American who grew up on grunge, it seems like a heroic act of will. But Bhiman's songs would be remarkable from anybody: He's a penetrating melodist as well as an accomplished guitarist and a striking singer. What he says he likes best about songwriting is wordplay, which can be heard in the tricky rhymes that populate his new album, Bhiman, out today. Bhi Bhiman is a work in progress. He gets a lot out of his guitar and some spare accompaniment, but he's mired in four-four rhythmically and his personal songs don't sink as deep as the descriptive ones. Nevertheless, he's an original in a folkie mode that always looks played out until the next surprise from nowhere comes along. That surprise begins with the first track on Bhiman, a song called "Guttersnipe" that had me listening before his voice even entered.